The pace of the Orchid Observers project has really accelerated through the summer. Alongside an overwhelming quantity of records, we’ve seen people from all corners of country getting involved. Records from far flung areas like northern Scotland have not been uncommon whilst some species have been recorded in entirely new locations. But it’s not just the public who’ve been out photographing orchids. Over the last 12 years, I’ve criss-crossed the country in search of some of our rarest and most enigmatic species. This year has been no different only this time, I’ve been able to use my photographs of the 29 specially selected species to feed directly into the Orchid Observers project. Working full time here at the Angela Marmont Centre means I have a 2 day per week window through the orchid ‘season’ to catch certain species at the optimum moment and snag the perfect photo. Here I’ll give a brief overview of where I’ve been and what I’ve seen. The last weekend in May was the first major excursion I made with Saturday devoted to a tour of some ancient limestone grassland and woodland sites around Gloucestershire. It began with a visit to the beautiful Selsley Common where, despite it being quite late in the year, Green Winged orchids (Anacamptis morio) were scattered across the upper slopes, just clinging on in the afternoon heat. 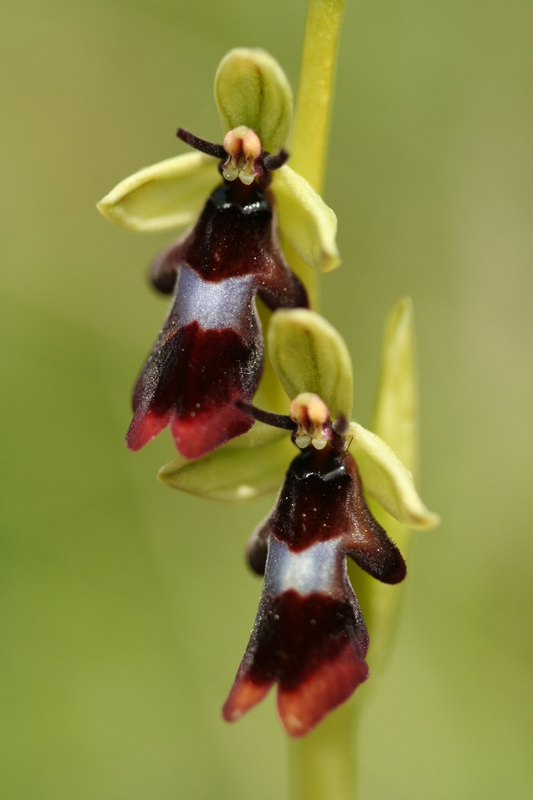 Further on I came across my true target – the Fly orchid (Ophrys insectifera). I counted around 20 plants on the open download just coming into flower. Their shiny blue speculums, designed to lure male digger wasps, were iridescent against the velvet chocolate surface that makes up the labellum. It was also in this area that I observed my very first Chalk Fragrant orchids (Gymnadenia conopsea) of the year, just beginning to open alongside a few Common Twayblades (Neottia ovata). The unique flowers of the Fly orchid (Ophrys insectifera) in Gloucestershire. Photo by Mike Waller. The next stop was a short one and only a mile from Selsley. A small lane passing through some ancient Beech woodland where White Helleborines (Cephalanthera damasonium) hide in the gloom, protruding as widely spaced individuals from the crispy leaf litter. The flowers barely open in this species and are mostly self-pollinated. My final destination was a mysterious and little-known location for the Burnt orchid (Neotinea ustulata) deep in the heart of Gloucestershire. Despite reports of only 3 plants, I eventually came across several small groups scattered across the rough grassland bringing the total up to 24. Rafts of Early Purple orchids (Orchis mascula) were looking quite tired but a single Greater Butterfly orchid (Platanthera chlorantha) was still in tight bud beside the main path. A group of Burnt orchids (Neotinea ustulata) is now a rare sight in the British countryside. Photo by Mike Waller. 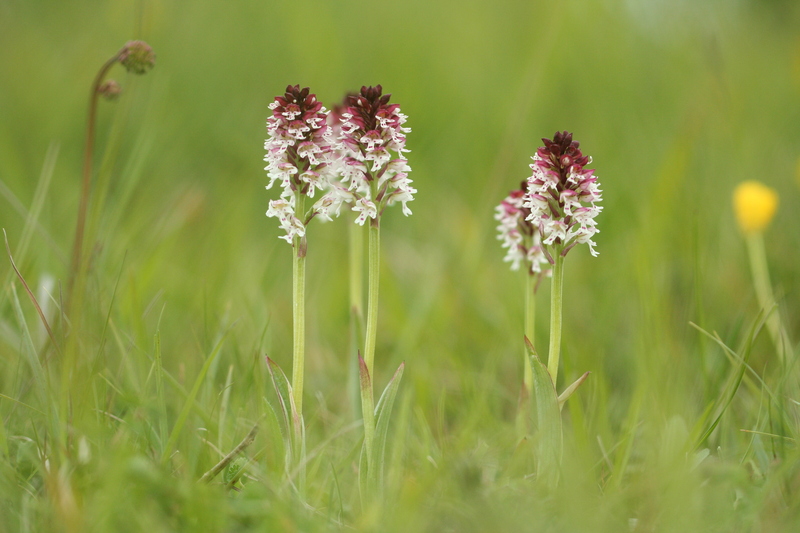 The Burnt orchid has suffered one of the most catastrophic declines of any orchid in the UK with a 79% loss from its past historical range. The causes for this are complex but primarily stem from agricultural changes. This particular location represents a relic from a time when it was far more widespread. Then came Sunday and a race up to Sandscale Haws in Cumbria for the diminutive Coralroot orchid (Corallorhiza trifida) with fellow orchid enthusiast, Sean Cole – AKA ‘Mr. Orchid’! Sandscale Haws is a vast duneland reserve managed by the National Trust with many rare species such as Natterjack toads. This year was, however, shaping up to be a special one for Sandscale. A few days previously, volunteers had recorded the highest number of Coralroot orchids since 1991 – the year I was born! Well over 1000 spikes in just a hand-full of slacks (read more about it here: http://sandscalehaws.blogspot.co.uk/). 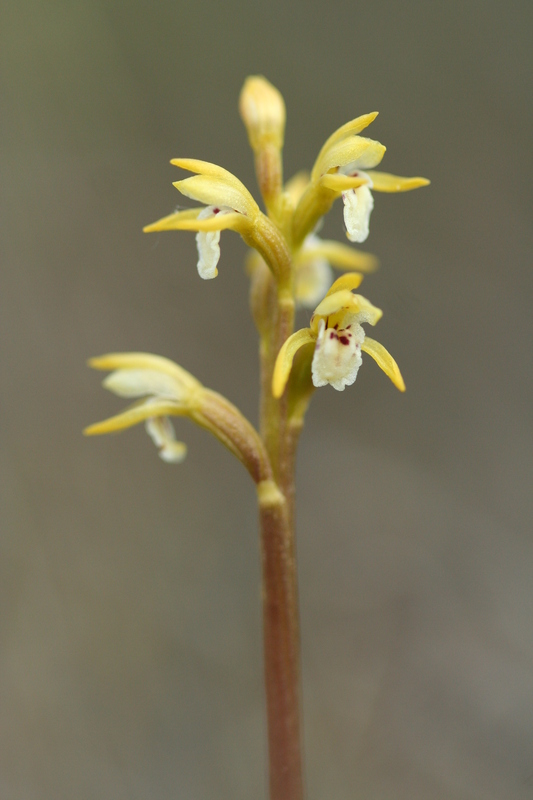 Each individual flower of the Coralroot orchid (Corallorhiza trifida) is few millimetres across. Photo by Mike Waller. The Coralroot orchid is an arctic-montane species that really belongs in the open shrubby tundra and pine woods of Scandinavia. Curiously, it is leafless and relies on parasitising it’s fungal ‘partner’ for nutriment. It is also miniscule and rarely attains a height of more than 15cm which makes it doubly hard to spot amongst the extensive mats of Creeping Willow under which it hides. Alongside the Coralroots were several Bee orchids (Ophrys apifera) in bud and the odd Early Marsh orchid (Dactylorhiza incarnata) just preparing to flower. Fast forward a month to the last weekend in June. Reports of a newly discovered location for the equally diminutive Lesser Twayblade (Neottia cordata), just inside Herefordshire, prompted a visit. The remote Olchon Valley, running parallel to the Welsh border, was said to be the place and I quickly came across several large plants (>10cm!) nestled amongst the heather on domed platforms of Sphagnum moss. Mom had been dragged along for this day and also helped find several more in the general area. 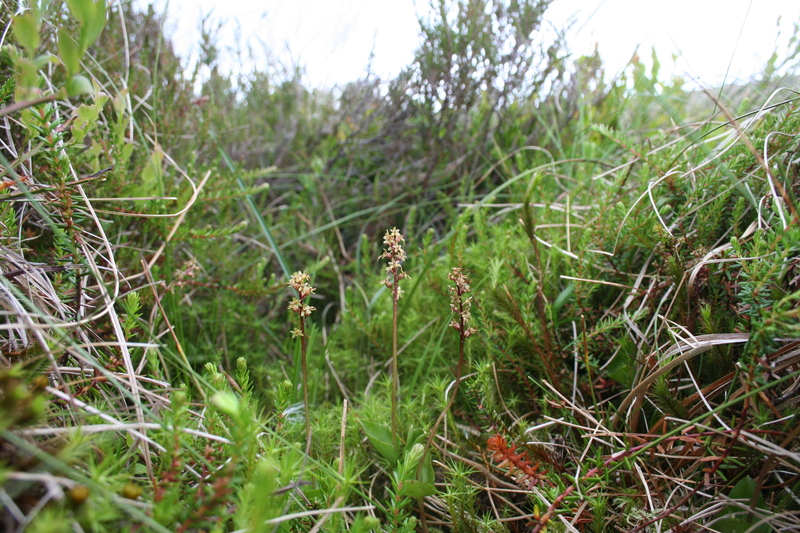 The Lesser Twayblade (Neottia cordata) is a montane species that thrives under heather on damp moorland. Photo by Mike Waller. From there, we struck out across the border into Breconshire to a tiny Wildlife Trust reserve that holds Wales’ last reliable site for the increasingly rare Small White orchid (Pseudorchis albida). Only 2 were seen amongst a thronging mass of other hay meadow flowers. A stunning display of Heath Fragrant orchids (Gymnadenia borealis) and Heath Spotted orchids (Dactylorhiza maculata) was a real treat alongside 6 Greater Butterfly orchids (Platanthera chlorantha). 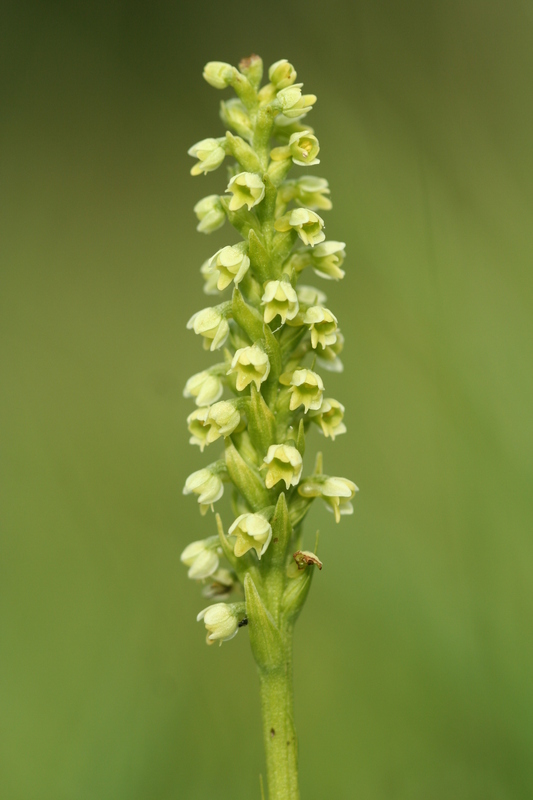 The Small White orchid (Pseudorchis albida) is now critically endangered in Wales. Photo by Mike Waller. Being able to observe these stunning little plants out in the wild is always a real privilege. The opportunity to be able to use their phenology as a proxy for climate change research makes finding them just that little bit more exciting. Don’t forget to keep uploading your records to the website!